Everyone are reeling with unfortunate surprise after the infamous Thanos Snap, and still tried to understand what just happened. Some of the so-called heroes of humanity- the Avengers were also victims of the Infinity Gauntlet's snap; Black Panther, Dr Strange, the Guardians of the Galaxies, and even our friendly neighborhood- Spider Man. Meanwhile, others are slowly recovering with the help of the B.A.R.F. technology (Binary Augmented Retro-Framing) created and introduced by Mr Tony Stark a.k.a. 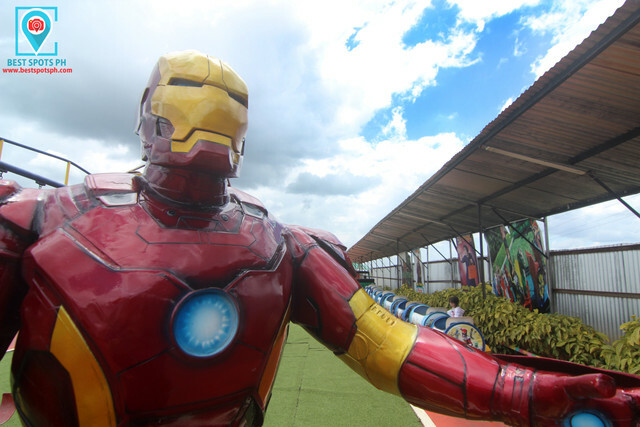 the Iron Man for therapeutic pursuits, and somehow finding new hopes to overcome the traumatic experiences. 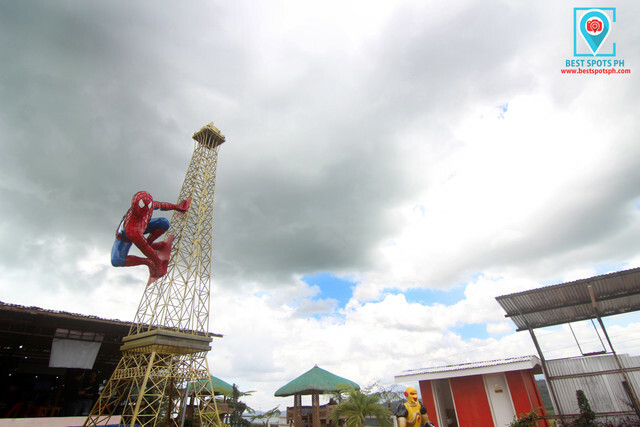 And in reality, it took us approximately an hour and 45 minutes to finally reach this Amusement Park from Cagayan de Oro City. Bonseta's Fun Fun Ride is an amusement and themed-park having opened last 2017. 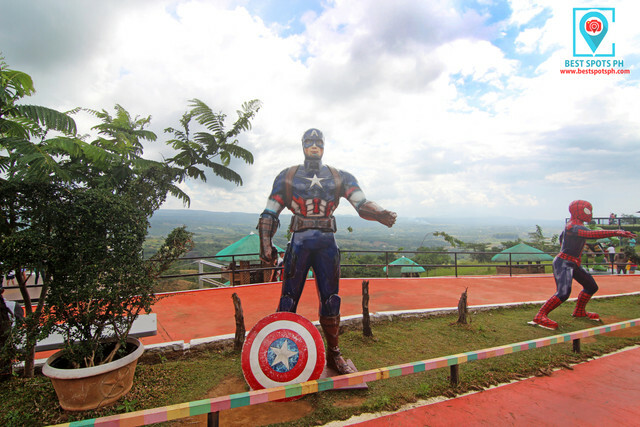 It is located along the Cagayan de Oro-Talakag-Lantapan Road in Barangay Salucot, Talakag, Bukidnon. I am one of those "adults" who loves Stan Lee's Marvel comics very much, and even DC comics. I can even remember i had several marvel comics such as the X-Men, Fantastic Four, DC's Justice League, and of course, the Avengers during my teenage years. I even had toys, and text cards with rich characters of the two renowned comics. It was a great collection back then! Searching for other Avengers such as Thor, the Iron Man, the Incredible Hulk, Captain America, the War Machine, Black Widow, and the others after the finger snap, (Don't you know it's one of the most iconic moments of all time- i mean in MCU?) was the best option to form a new breed of alliance, and it's not an easy process... Okay, back to reality. The place was actually introduced by my sister when she invited us to check out the place for a family picnic. I heard this place before having more than a dozen of different characters within its compound, and of course a panoramic view of Talakag. The lovely family. #WeAreFourNow. 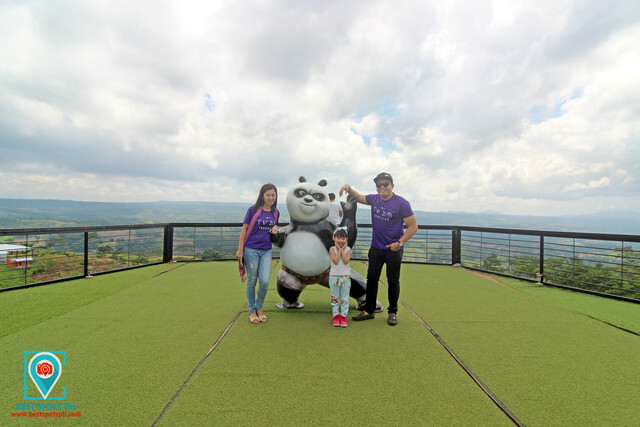 Look how the Kungfu Panda guards the viewing deck! Upon arrival, we were surprised by this landmark, a convenience store with a name 24/7 similar to that Japanese-owned American International chain of Convenience Stores- the 7/11 Convenience Store. It's funny how the color resembles to that of the famous brand. Anyway, we paid P50.00 per adult for the entrance fee, while the kids rate is at P20.00 per head. 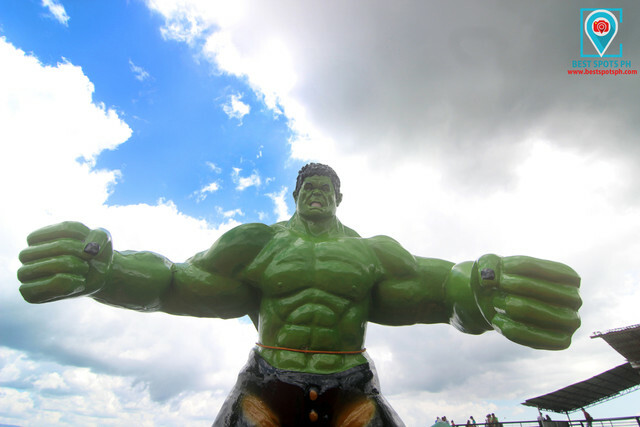 Few steps from the entrance, we were again surprised with the massive size of the Incredible Hulk! A pinoy version of the Incredible Hulk? 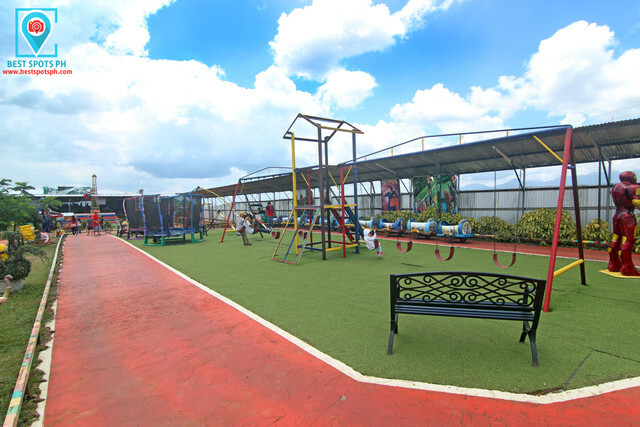 Swings can be enjoyed at the place, slides for kids are also present, while hiding places for kids are also there beside the trampoline. 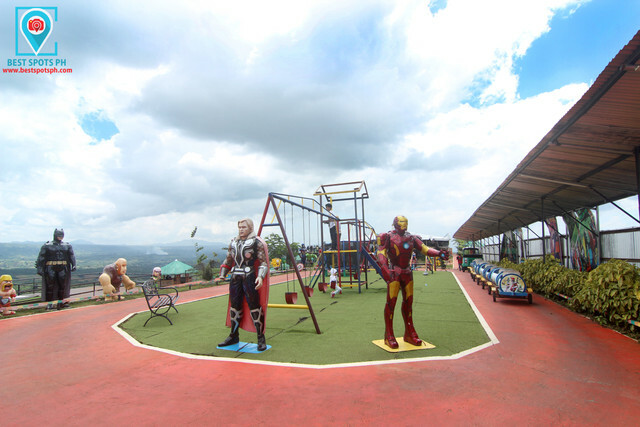 Meanwhile, avenger characters like Iron Man and Thor (guarding the exit area), Spider Man (who is hanging at the famous Eiffel Tower), Captain America, Hawk Eye and Black Widow, DC characters such as Green Lantern, and Batman (Wait, where's the man with the red cape- Superman? 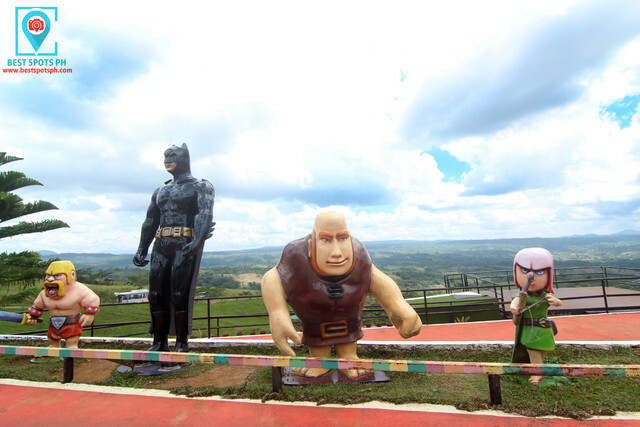 ), even Snow White and the dwarves can be found in this place. Other characters are also present where unfortunately, i am not familiar with although Kung Fu Panda can be seen few steps from the restaurant guarding the viewing deck. 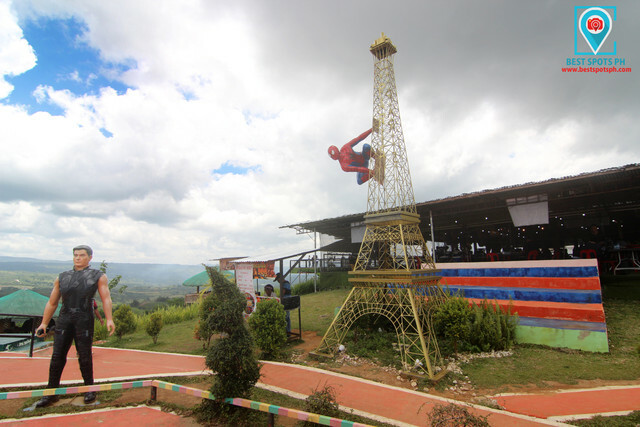 The friendly neighborhood- Spider Man at the Eiffel Tower? 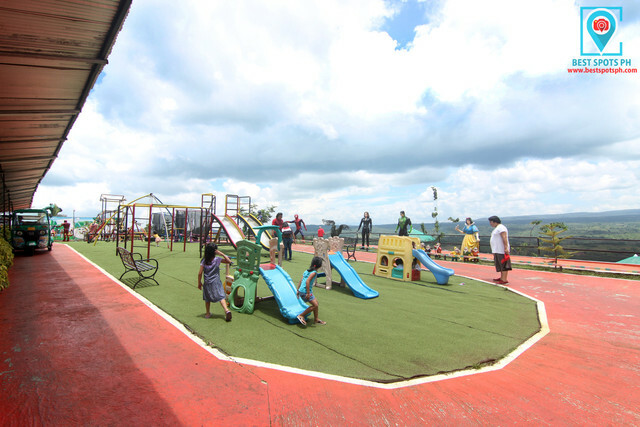 Aside of the dozen and more characters, the place offers different "fun rides" such as the ATV motors around P500.00, hanging bridge which will cost you P20.00 per head, and a train made of barrel at P20.00 per head. The train is good for kids, and kids at heart though. There are also cottages to choose from with different rates starting from P150.00 to P250.00 per hut. I wasn't able to check out the motor bike museum though because i just knew it when we departed. Although food is not a problem because the place offers a full-service restaurant, the meals are not that sumptuous; it's just something to fill the stomach, but not something to be praised of- I mean, food is life! 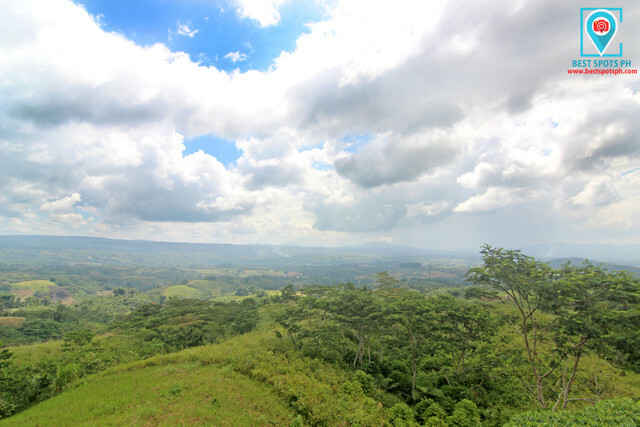 The viewing deck is what i like the most- showcasing the panoramic view of some parts of Talakag. Well, definitely, this place is good for kids and kids at heart, just bring your own food. Good thing my daughter and nephew loves the rides!